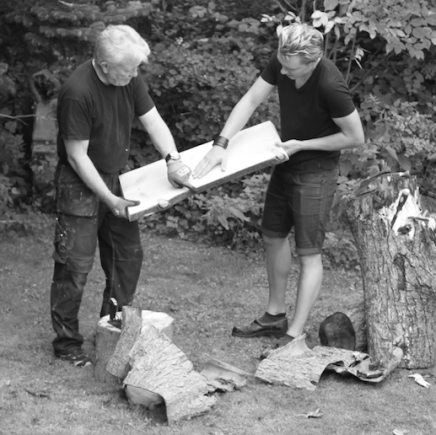 All our raw materials are made from Danish wood – both from trees that went down in a storm and trees that were chosen to be cut down anyways. Each tree is chosen specifically to be a part of the Molberg production. The trees are transported home, where they are stored for at least 5 months in order for them to dry up. 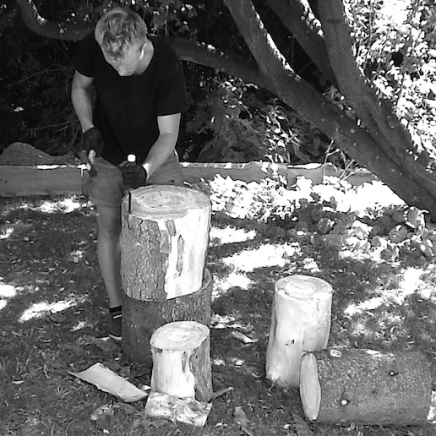 When the 5 months have past, the wood is processed with tools and by hand with respect to Nature’s own design. The product is then grinded and maybe also swabbed with fx. grapeseed oil and post-dried for another month and it is then ready to be a part of Molberg’s product line. OBS! Wood is organic and it will naturally develop cracks and generally change due to the humidity in the air over time. These natural cracks makes each product unique and will often occur in our stumps and coasters. Wood is organic material and can be decomposed by sun-lights, wind, water and microorganisms. But with the correct precautions, a wood-product can last for centuries. There are several theories on how to take care of your wood-furniture. Our experience show that products that are in contact with foods are to be cleaned with a damped cloth. Wood should not be put in the dishwasher or be soaked or placed in a damped area, as it destroys the structures of the wood and curses fungus. Do not expose the wood product to extreme temperatures over a longer period of time.